You will notice composition and expression are the main themes of these photos, and in Taxi Driver you get both. Directed by Scorsese, who also makes a cameo in this scene, the film has now taken noir cult status, focussing on the loneliness of the life of a Taxi Driver. In this scene Scorsese asks the driver to bring him to his home so he can spy on his wife. There is resignation and anger etched across his face, two feelings the driver can associate with. There is great dept of field too with a little bokeh, think 35 or 50mm lens wise closing the aperture down. What is so special about this scene I hear you ask? Well, believe it or not, it’s because it’s actually real. While making the film Apocalypse Now, Martin Sheen developed a great need for alcohol, and effectively became an alcoholic. In the scene where he punches the mirror he is very drunk, but Coppola suggests they continue to roll, which they do. Unfortunately only days later Martin had a massive heart attack, which he survived returning to set six weeks later very sober. Although Sheen was not the original dream castee for the role in a film depicting the futility of war, it is certain he made the character his own, and turned in an epic if not sobering performance. Modern Times was to be his first talkie, but Chaplin scrapped the script and made the film a silent masterpiece. And we’re not complaining. After travelling around Europe, and experiencing the Great Depression, Chaplin came across Gandhi, who was firmly against Modernisation. Although not totally against it, Chaplin agreed it had cost jobs and felt therefore it created poverty, so he set about creating the film. What is incredible is how clear stills like the one above are, how little Bokeh there is, and how well composed the shot is. Might give you an idea on how to use your studio space, which you can always rent. The soft colouring, the bokeh, the sharpness and the composition, what more could you possibly demand from your subjects? Emotion. And this photo gave it in spades. Burton and Taylor, both of whom were in loving relationships, met for the first time on the set of Cleopatra. It was to create fireworks, and not just between the couple but also in the global media. There is no doubt looking back it is easy to see how in love they were, but at the time it would be interesting to know how many knew. Ok so it is not a still from the film, it is however a promotional still, but who cares. It’s a redefining moment in Hollywood, where the rule book was thrown out, but the old structuring of beginning middle and end, were kept. (Joseph Campbell, A Hero with a thousand faces). And why not. What is great about the still is what it portrays. Uma Thurman, a shy young 23 year old, is exploring herself through film, in a role she wasn’t sure of, but was glad she took. She is a virgin of big Cinema, on a bed made for a queen, chugging a fag while gripping a gun. No doubt loaded. What’s more iconic than this? Dr Zhivago was the book which should never have been, which made the film which nearly never was. Made mainly in Spain, as Russia was out of bounds, David Lean brought together a Stella cast of people who in the end, under different conditions, might not have had any part in the film. The likes of Caine, Brando and Peter O’Toole shunned the chance to take part, Caine even getting to the part of going through the Dailys with Lean and Proposing Sharif. But it was the female performances which make the film. Julie Christie was exceptional and her ability to play the young puritan in distress is second only to her performance as the weather beaten older version. The photography is Lean at his best. Not even Dustin Hoffman thought he would get the role of the seduced College boy, but he did. Robert Redford and others were further up the list but he was chosen in the end, because he was actually out of place. Either way it worked perfectly. Anne Bancroft, the seducer, was 35, and even though he was just 6 years younger he played it wonderfully. The scene above is now very famous, but it was risqué for it’s time. Again great dept of Field, with a wide angel shot getting everything including the lines and angles created off the leg. For some this simple film is the greatest ever made, for others it is one of them, either way it is hard to fault. Great film photography is about capturing only what you need to, and keeping it as realistic as possible. This film does this maybe better than any other. The cast is completely comprised of untrained actors and people found on the street. The film is shot on the street, nothing is done in the studio. 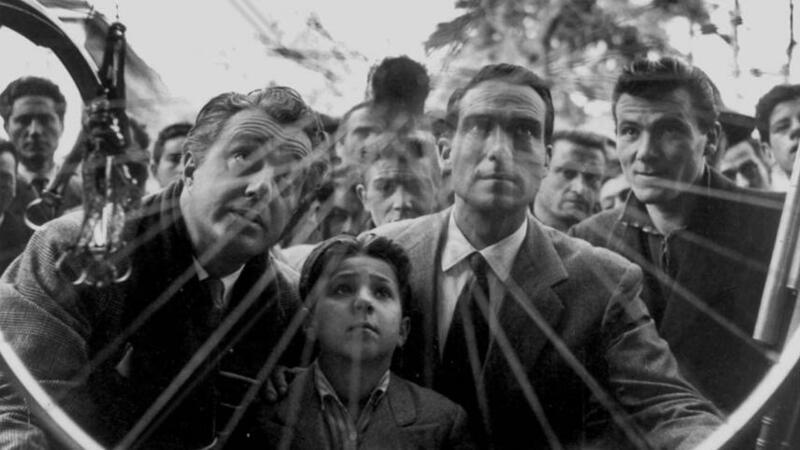 The storyline is basic and revolves around the poverty of post war Italy, and although it may be classed as Neo Realism, in truth it is a very simple gem, similar to the film Once made in Ireland, painted in the mind of a master, Vittorio de Sica. Orson Wells understood the power of the press and the people behind it, and this is why Citizen Kane is so iconic, and why this photograph says everything about what a media mogal really stands for. Kane and Wells were making a statement, yes the script came from Mank, but only half of it, the acting the direction and the selling of the project came from Wells. Mank disliked Hearst because he made the writer feel like he didn’t fit in, but it was Wells who was really bitter. He had found it hard to break in to RKO after they plucked him from obscurity after War of the World’s, and so this became his opportunity to show everyone what he could do. He would go on to later live in the attic of Robert De Niro’s Mother’s studio, old and battered by war after war, but it was here where he stood the tallest, few men braver ever graced the industry. Chaplin understood the system similar to Wells, except he was wise enough to choose a foe thousands of miles away, less likely to hurt his career. Citizen Kane and The Great Dictator had big boots to fill, as Gone with the Wind, the big studio’s first Colour Picture, had just been released the year before, in 1939. And fill them they did. To the brim. Chaplin was always left of Centre politically, something which would later hurt him in a right leaning America, but he also despised Hitler. The film boasts the greatest ever speech written or given in motion picture, and it was delivered at a time when it was greatly needed. This photo above should be an inspiration to those thinking along the same lines in today’s society. History always repeats itself, so they say…. Lovely article. I have a favourite shot in a movie but it’s so fleeting I find it hard to even grab it from the film itself. It’s a bit of amateur footage, caught on the fly, from the documentary Glastonbury by Julien Temple. It carefully zooms in on a woman in silhouette against a sunset, twirling something (what? I’m not sure) in front of her as bubbles float past. Now, I’d like to think I’m no sucker for sunset shots which have become much overdone but I really love that one. Partly, I guess, because it’s caught in the moment and also as it’s being part of the wonderful chaotic collage of fleeting festival life that that doco presents. I love this Simon, and in a way this is what Oasis were talking about. A memory not necessarily caught on camera but remembered. What a FANTASTIC collection of iconic images you’ve presented! Although most of them were familiar, their power is multiplied when seen in aggregate. Loved your comments and observations as well. Marvelous post! That shot of Chaplin-as-Hitler holding the earth-as-balloon always fills me with a bit of terror. Such an incredible – and frightening – scene. Also, glad you included the still from “Bicycle Thieves”. That shot pulls at your throat, doesn’t it, the way they stare longingly at that bicycle. Hello, thank you for sharing this post. I already watch some of these movies and seeing them from their perspective was very enriching. I will certainly pay more attention to such details Thank you.